Vabimo vas na predstavitev zbirke Fitch Connect. Zbirka vsebuje finančne podatke za več kot 33.000 svetovnih bank in okrog 11.500 zavarovalnic iz več kot 120 držav, zgodovina podatkov pa sega do 30 let. Na predstaviti bomo spoznavali funkcionalnosti vmesnikov Web in Excel add-in. Web: Zmogljiv in intuitiven vmesnik. Vse vsebine Fitch-a prinaša z naprednimi zmogljivostmi iskanja, analitičnimi orodji in funkcionalnostjo. Excel add-in: Ocene, finančne podatke in analitike sestavite hitreje in bolj učinkovito v predhodno narejenih in prilagodljivih Microsoft Excelovih predlogah. Za dostop do platforme si morate ustvariti uporabniški račun, zato vas prosimo, da na elektronski naslov martina.petan@ef.uni-lj.si sporočite, če želite uporabljati zbirko. Študenti sporočite svoj elektronski naslov UL (več informacij o aktiviranju UL e-naslova) ter posredujete podpisano dovolilnico mentorja za uporabo zbirke. We invite you to Fitch Connect collection presentation. The collection contains financial data for more than 33,000 global banks and around 11,500 insurers from more than 120 countries and the history of data is up to 30 years. At the presentation we will learn about the functionality of the Web and Excel add-in interfaces. The presentation will be in English language. Web: A powerful and intuitive front-end interface. 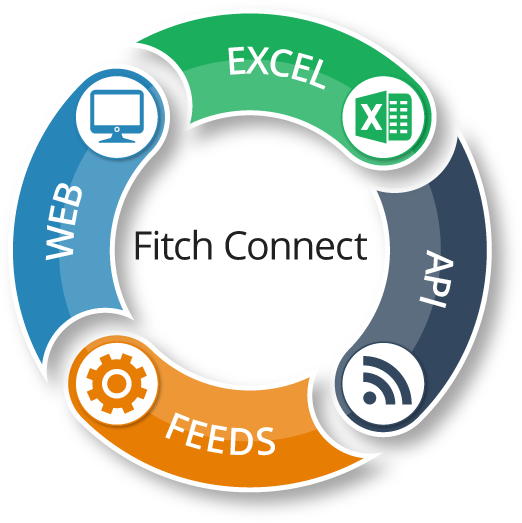 Delivers all Fitch content with advanced search capability, analytical tools and functionality. Excel add-in: Compile ratings, financials, and analytics faster and more efficiently from within pre-built and customizable Microsoft Excel templates. To access the platform, you must create a user account, so please email to martina.petan@ef.uni-lj.si if you wish to use the collection. Students should notify their UL e-mail address (more information about activating the UL e-mail address) and provide the signed tutor's permission to use the collection.